Call me crazy, but I was afraid of roasting a whole chicken. I had different reasons not to try it – it is just as cheap to buy a roasted chicken at Fairway/Wholefoods/Other grocery store as an uncooked one; roasted chicken is dry; I was a scaredy cat. Everyone and their mother was roasting chickens around me, claiming it’s ridiculously easy. I didn’t believe the hype. 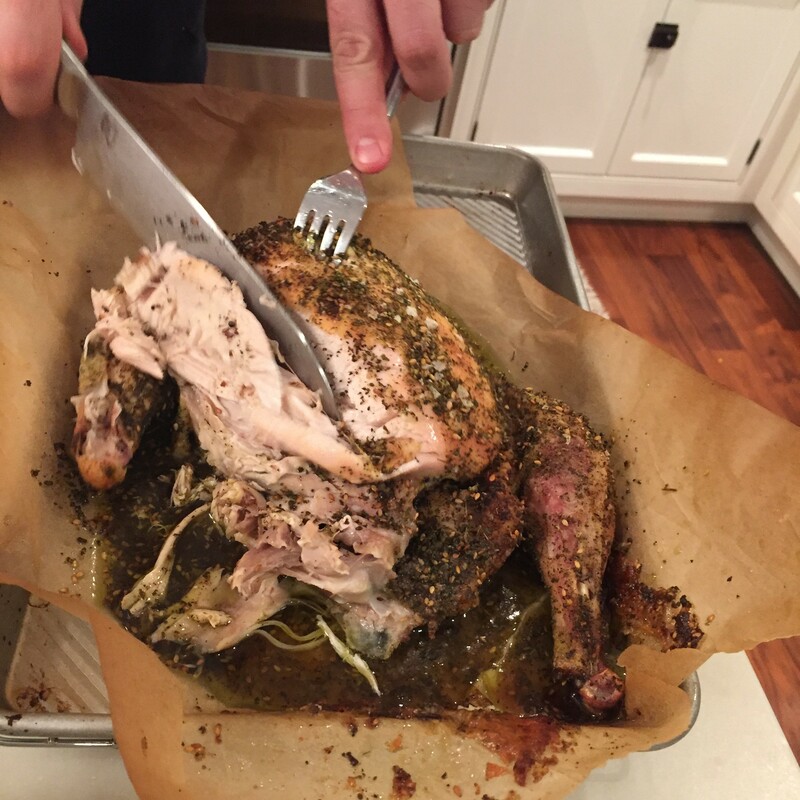 I will confess – I finally roasted my first chicken this year (2016) and it’s really only because my friend, Kati, came over with a chicken that she roasted in my oven. Yup, that’s literally how it happened. I saw just how easy it is to do and now I roast a chicken almost every week. Granted, it’s only been a month since she taught me the Thomas Keller method of roasting a chicken, but I’m telling you: it’s easy. Around these parts, we call it the Kati chicken. You take a chicken (I like to use an organic, locally farmed chicken, but you do you) and dry it. Don’t wash it first (this spreads germs all over your kitchen). Just lay out a bunch of paper towels, then blot the chicken, inside and out, with more paper towels. Do this until it no longer looks wet. Then, wash your hands. Now, sprinkle the entire chicken with salt. Don’t get too crazy with the salt or else it will be hard to eat the skin, which is my favorite part. Make sure you get salt all over the bird. This will seal in the moisture. Now, if you want to proceed as is, just put the chicken on a parchment lined pan and put it in a 400 degree oven for an hour and fifteen minutes. Ready to kick it up a notch? I cut the salt quantity down to just a heavy sprinkling and add a heavy handed sprinkling of za’atar. You want that bird to look green! Now, throw it in the oven…The prep time is about five minutes. The oven then does all the work. The result is sublime and gets rave reviews from every member of my family. I highly recommend it! By the way, I like to collect all the juices that collect at the bottom of the pan and use them to either dip in or drizzle on top. The chicken is just as delicious (if not better) the next day, but it’s pretty rare for us to have leftovers! I served the chicken with fried rice and edamame. My total working time in the kitchen was 15 minutes! Here’s the rundown on the fried rice – take leftover white rice or boil some in a pot. Put a tablespoon of sunflower or vegetable oil in a pan. Add a chopped onion and two eggs and stir constantly to scramble the eggs and until the onion is softened. Add another tablespoon of oil along with the rice and any vegetables you have on hand (I love to use up frozen veggies like peas, carrots, broccoli here). Stir until everything is cooked and the rice gets a bit of a crunch at the bottom. Toss in a tablespoon of soy sauce and voila. Instant side dish!